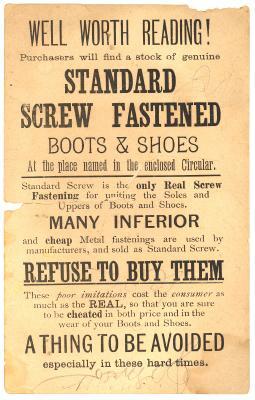 Standard Screw Fastened Boots and Shoes Have no Equal -- My Papa is Going to Buyer Me a Pair of Standard Screw Fastened Shoes - He says: "They are Best in the World"
Measures apx 3-3/8" x 5-3/8". Light corner wear. Horizontal crease apx 1" from bottom. 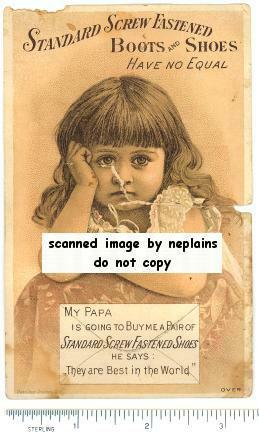 Horizontal tear at center. Few pencil marks on back. Light stain at bottom corners.